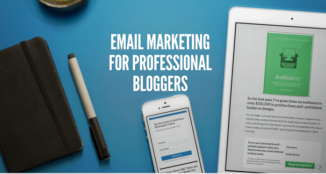 It’s a no-brainer that content upgrades are one of the best ways to create a highly targeted email list. 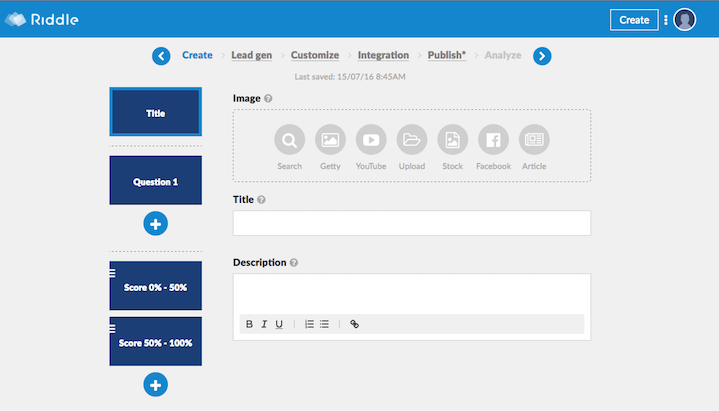 Did you ever wonder what would happen if you added quizzes as a content upgrade for lead generation? Well, it would not only increase your lead generation by 200% but it would also increase your overall user engagement by a similar margin. Many big brands are already using quizzes to capture leads & if you haven’t started using them yet, you can start doing it today. 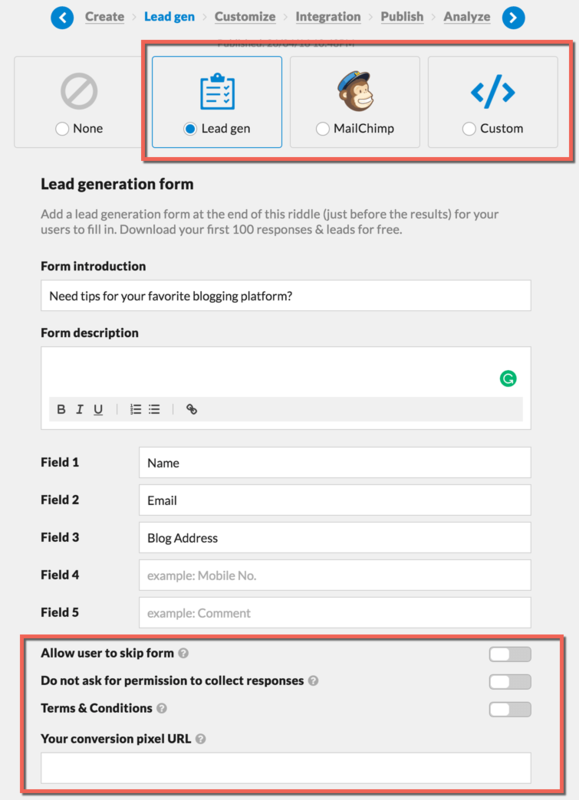 Today, you will be learning about Riddle, which is a great tool for email marketers to create quizzes, polls, tests, and surveys. These are also called “interactive content”. A major entertainment blog saw a 504% lift in FB comments and shares using a personality test. Across publishers, using a quiz, list, or personality test gets an average increase of 3:17 seconds time spent on site. 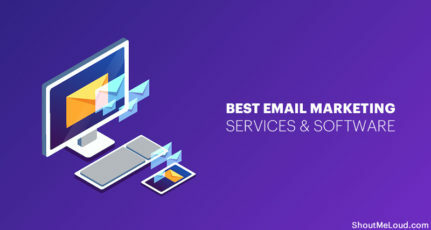 This is all thanks to services like Riddle, which is helping publishers like ShoutMeLoud, BBC, Arsenal, and Adweek create & embed quizzes for their sites (and in turn surveying and capturing email leads). The best thing about this service is you can create & embed a quiz (or other interactive content) in 5-10 minutes. 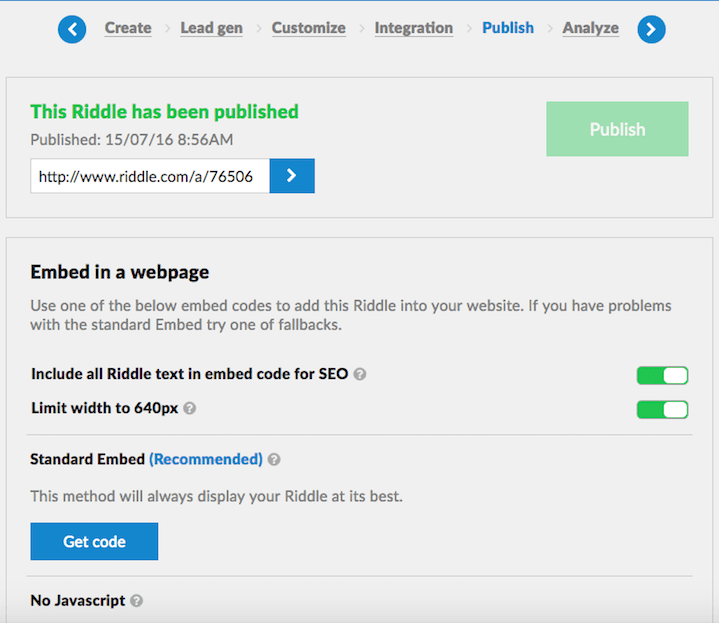 If you are using WordPress, you can use the Riddle WordPress plugin. For other platforms, you just need to copy-paste the code to embed some stunning and playful content onto your blog. However, I don’t want you to take my word without any proof. 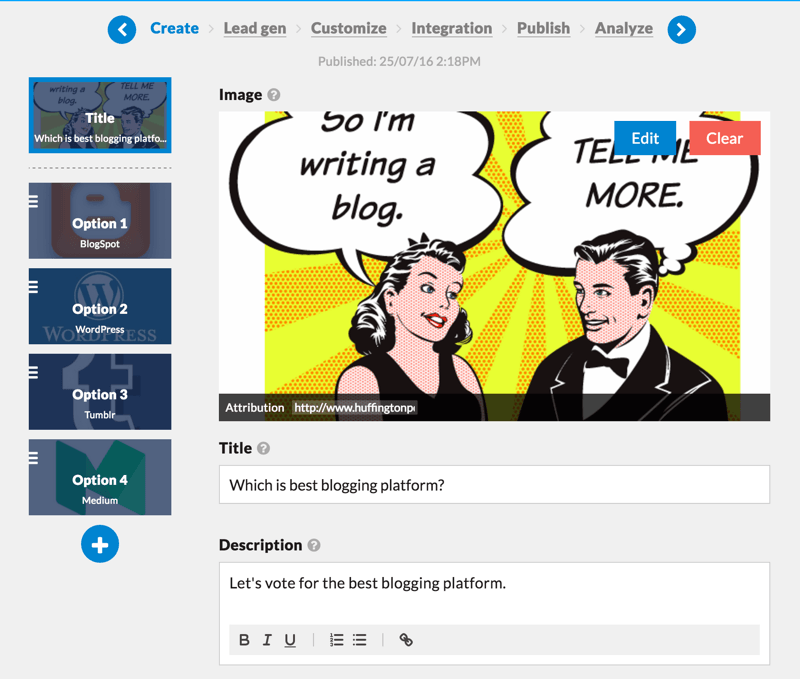 I am about to show you how easy it is to create a lead-generating quiz with Riddle. Quizzes and polls are a two-way street; for them to be effective, you need a person’s attention and, in most cases, their interaction as well. This kind of content will help you get a highly-engaged user base in a very short amount of time. Search images, videos, and animated gifs right from the dashboard. Option to use your own images. 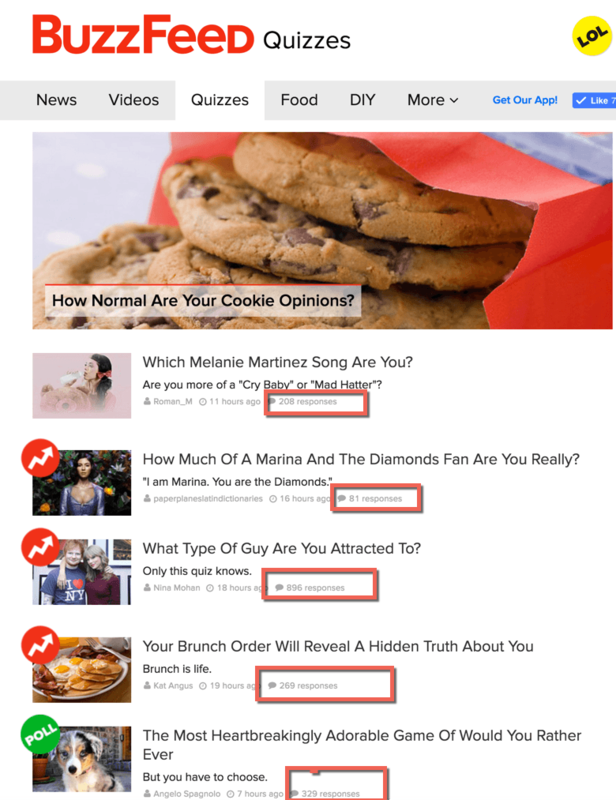 In-built social sharing: This will allow your readers to share quizzes & drive viral traffic. 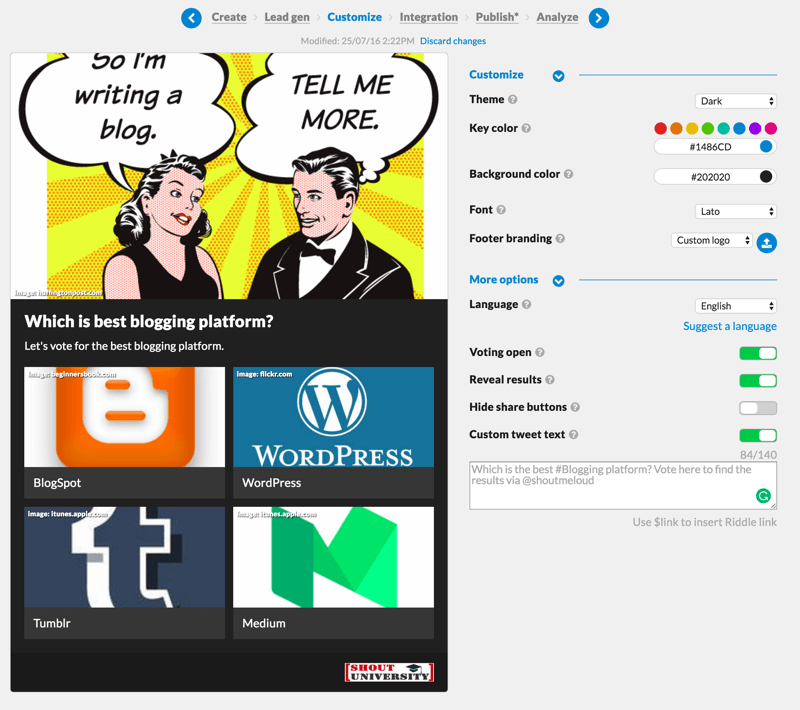 Place interactive content anywhere on your WordPress blog using shortcodes. 14-day free trial & after that only $4/month for the basic plan. 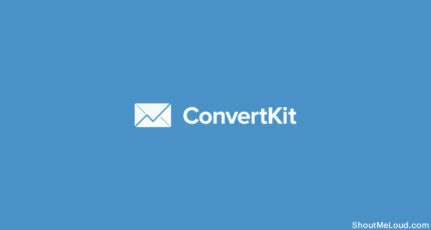 Out of the box integration with MailChimp. And there’s many more features. I will let you explore the rest of them by yourself. 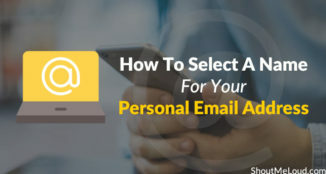 To get started, I suggest you create an account (with the free trial) & follow the steps mentioned below to create your first lead generation quiz. Riddle has a considerable amount of options (quizzes, polls, tests, etc.). For today’s review, we will choose “Quiz” because it’s popular and effective. When you click on “Quiz”, you will see the following interface. On the left, you can see the “Title” of the Quiz, the “Question” section, and a place to put an image for the quiz. 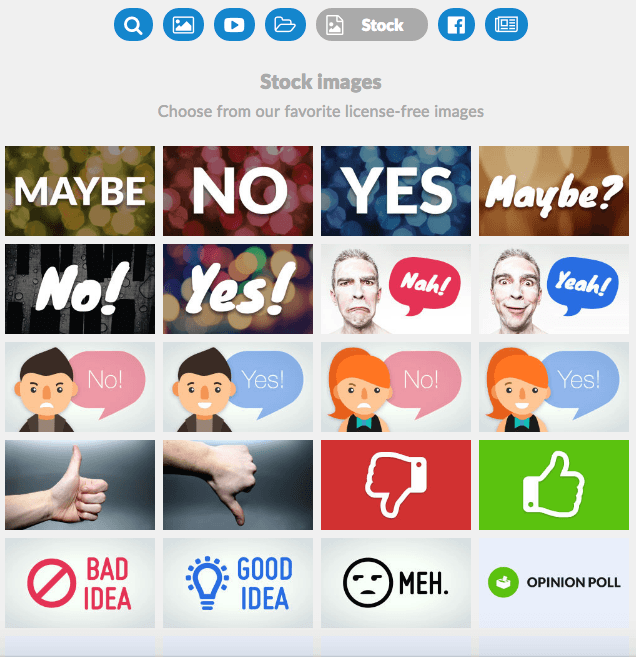 For each question, you can decide whether or not to use an image (with the option to give attributes to it). You can also add images to the answer. An option called “Correct Answer Explanation” explains the correct answer. I think this is a pretty neat option. This particular image (see screenshot above) is really good and is actually from Riddle’s built-in “Stock Image” collection. It isn’t exhaustive, but it works for simple quizzes. 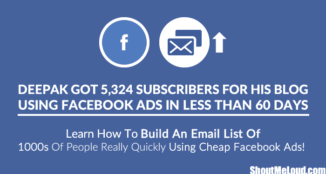 Once you’ve created the quiz, you can choose to generate leads from the quiz. 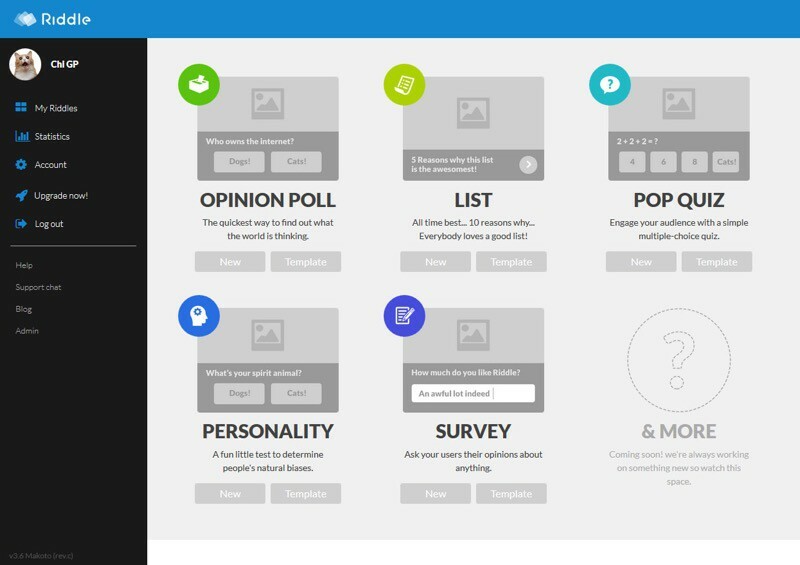 It’s a simple form where you can collect the details you want from users. You can choose to make the supplying of this information mandatory or voluntary (always a useful option). The next step in the quiz creation process is the “Customize” part. You can customize your quiz extensively and seamlessly integrate it onto your website. By doing this, it doesn’t scream for attention and make it look like an ugly widget that you’ve installed. This is a very important option to have. After you’ve done customizing, you can integrate your quiz data with various other applications through Zapier.com. It can be a pretty useful option for those of you who are serious about doing something with the data you’ve collected. Every Riddle has a separate URL located on their website (with the obvious the choice to integrate it on your website). You get a simple embed code that you can add to any particular page. And voila! You are good to go. For those interested in the quiz I just created (which is just an example), it’s embedded below. Logging in, choosing the questions, adding images, preparing a lead-gen form, customizing, and publishing took me a total of ten minutes! I would say it’s definitely one of the most seamless and self-explanatory tools out there. Not only in terms of creating quizzes, but in general. The UX of this website is so straightforward that it only takes a few seconds to understand. The interface for each type of Riddle is different and that’s what makes it unique and seamless. 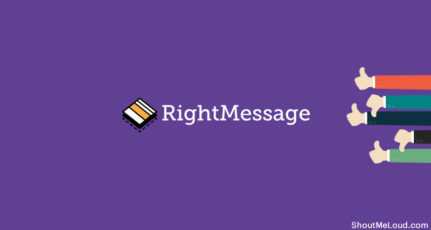 I urge all of you to try it out and integrate it onto your websites. The basic version starts at $4 a month and I would say that trying out this tool is an obvious no-brainer. Great idea Harsh sir, collecting emails we can grow aur readers and make a bigger email list. Thanks for sharing. Quizzes and Polls can surely helps big time in generating leads. I was using a poll over riddle with a CPA offer on one of my niche blog. I was amazed to see the input from audience. I had A/B testing implemented and every other riddle view got input while basic less attractive input dialogue failed miserably. wow Harsh amazing… I think this is very useful for travel bloggers like me. We can run quiz like favourite destination and the collect data. Hi Harsh, Another great piece of idea from your stable! I think interactive pieces of content like quizzes, polls, etc. are very attractive for users and a big attention-grabbers, making it way more likely to garner details. Also thanks for the in-depth guide on riddle. Very useful information about the capture lead. Thanks for discussing in details . Harsha, It’s really great article from your side, i completely understood how can i get good number readers to our post through Email Marketing, i see your hard work in article, good bro..keep posting..
please Harsh can this work on blogspot platform? Yes, it works on BlogSpot & Tumblr platform too. This is only for WordPress. 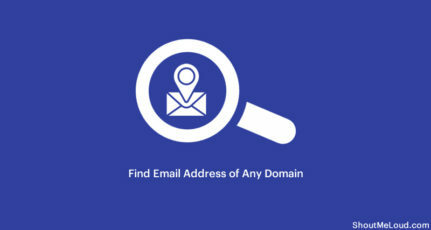 It’s really amazing blog from your side and very useful information about the capture email using. Harsha, It’s really great article from your side i see your hard work in article, good bro..keep posting.. Thanks for appreciating. Let me know how the strategies work out for you.